That’s ridic(ulous). Um. What? Also, how do they even determine that? Do you need to get a physical to join eHarmony? That seems difficult to pull off. Can’t people just lie about their health or how many times they’ve been married? Outside of the practicality concerns, this is also discriminatory and icky and I hate them a lot. Sick people want love, too. Opinions: Other people have them too! your piece really lets scott backer off with a slap on the wrist. clearly you have not been adversely impacted by the email since you are already very open about your ms, but many people value their confidentiality, and you seem to trivialize their concerns. breaching this all-important privacy is just about the worst thing a dean of disabilities services could do. you also shouldn’t be scouring the list looking for people you know; this action only serves to further undermine everyone’s privacy. on top of that, i disagree with the assertion that backer’s email was “extremely nice and well-intentioned.” it was a boilerplate email, nothing more, nothing less. 1. I didn’t state his name on purpose. While everyone in the Wes community knows who he is and what happened, partially due to an Argus news article, I enjoyed not including his name since the issue was a breach of confidentiality on his part. He revealed our names, but I don’t feel a need to reveal his in my piece. You revealed it in your comment. This bugs me. 2. What is the adverse impact that other people are suffering? The email was recalled and can no longer be seen by anyone, and as I stated in my piece, the email was not sent to the entire campus in the first place. 4. What I said, actually, is that my career plans make it hard for me to hide my invisible disability, not that I want to be very open about it. 5. I am not quite sure how one can “scour” a fairly short list of names. Also I don’t know why everyone freaked out about confidentiality if they didn’t assume that people would read the list. 6. Your use of “boilerplate” kind of makes me nauseous. I’m not going to pretend that this is a valid complaint on my part. *for some reason, when it comes to sexual orientation, we talk about people being “in the closet” instead of about confidentiality and privacy. Sexual orientation is something that society expects to know, not sure why. I don’t really feel great about this, but it’s weird that sexual orientation and many disabilities are both determined by our genes but we have such different feelings about them. Now, in case you were like “why is Cade so angry all the time?,” I’ll include a picture of my super adorable kitty. Because who can be angry with Nashi in their life? You can’t. Nobody can. Oh gosh this makes me miss home. 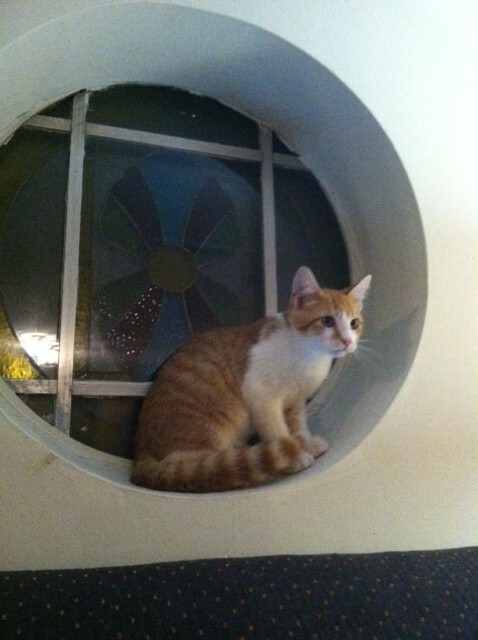 Circle stained glass window + kitty + upstairs couch. Hi, family. Hi, home. Hi everyone! I just wrote an opinion piece for the Wes newspaper (the Argus) and I thought perchance some lovely blog readers (aka parents) (hi, Mom! I miss you!) might want to see it (also maybe people who aren’t my parents). It has lots of opinions and is very controversial. Here ya go. It’s not actually that controversial. Can you tell that I’m nervous? PS Elizabeth writes an opinions column which is the loveliest if you want to look at that too. Ignore the medically-ness of the title, this is a blog post about regular old nerves, not my special damaged ones. Tonight is the first meeting of the student forum I’m co-teaching (with the lovely Jenessa) at Wes and I’m feeling pretty antsy. It doesn’t help that it’s a night class and I’ve had nothing especially urgent to do all day. That’s a lot of time to try on a million different outfits and do my nails and chip my nails and redo them and then spend a while trying to decide if I should add glitter and walk to Rite Aid and get a lot of snacks that I don’t especially need and try to make my hair look nice and take a lot of pictures of myself on my phone to accompany the opinion piece I just wrote for the Argus and … yeah. Stress. Nerves. But I’m also very excited and glad to be working with the group of students that are in the forum. It’s going to be all kinds of awesome sauce-um. Dad, I know you’re reading this and going “awesome sauce-um UGH yummy fun fun yay” and to that I say perhaps you should call me sometime and improve my vocabulary so I don’t say things like awesome sauce-um.